Sorry MV Emperor Orion is no longer sailing/ not running trips. 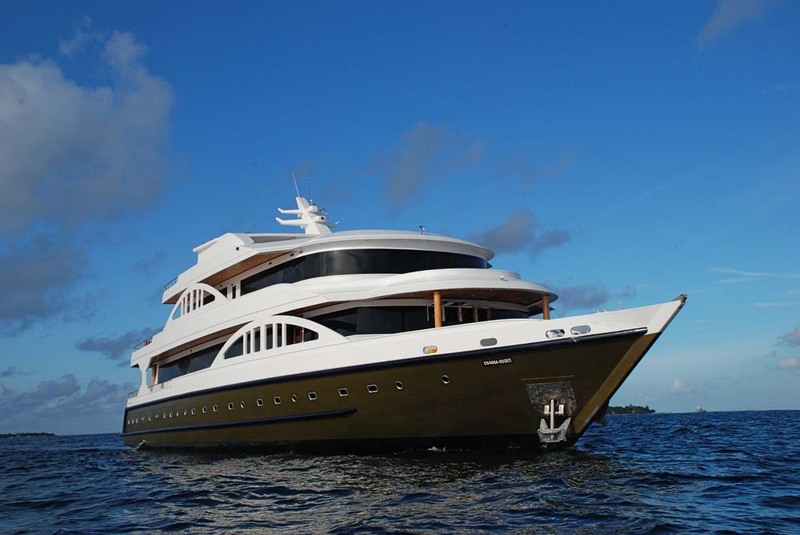 Maldives diving guests want the most luxurious boats while enjoying Maldives diving, regarded by many as the best diving in the world. 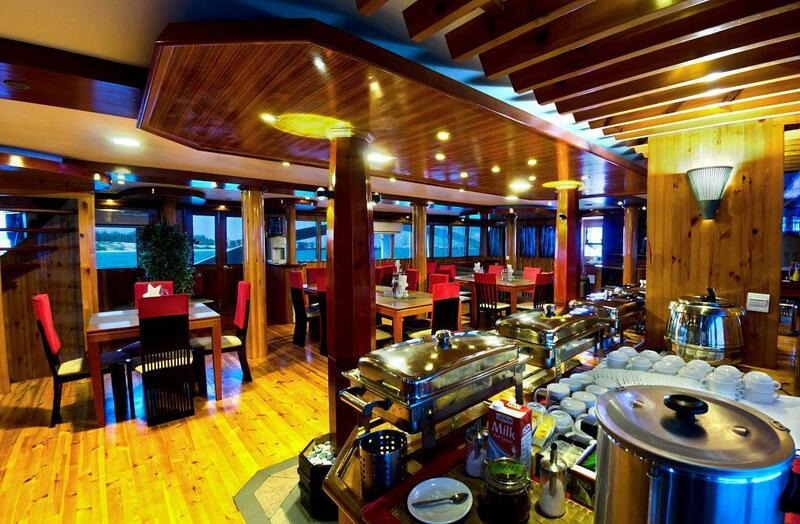 Emperor Orion ticks all the right boxes for divers and non-divers who want to enjoy luxury Maldives diving cruises without breaking the bank. 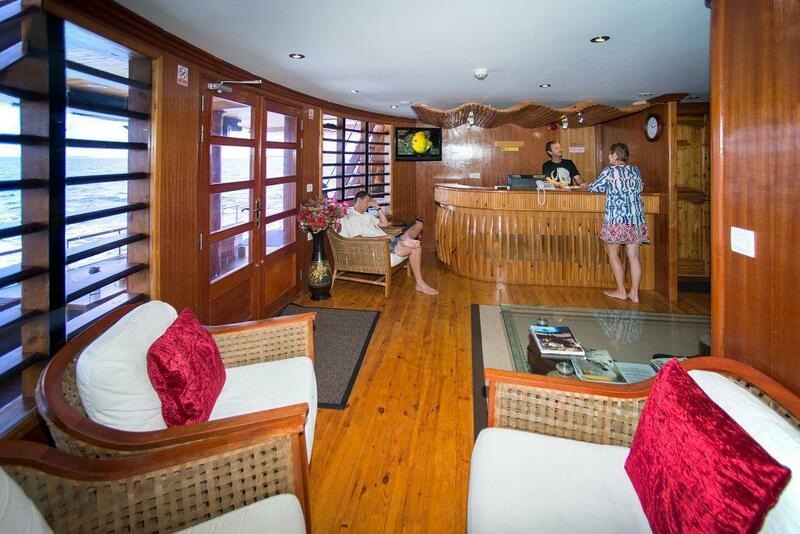 There is free Nitrox for certified divers, private & communal Jacuzzis on board, optional massage and wifi, fine dining, and lots of large areas to relax in private or socialize with other guests. Emperor Orion is a large boat (nearly 40m. 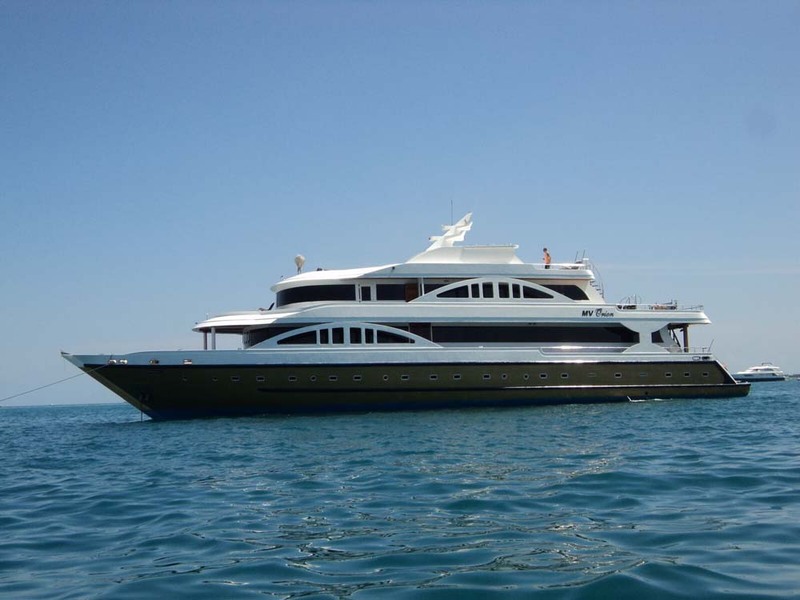 long) but has a maximum guest capacity of just 24 in twin & double cabins and luxury suites. 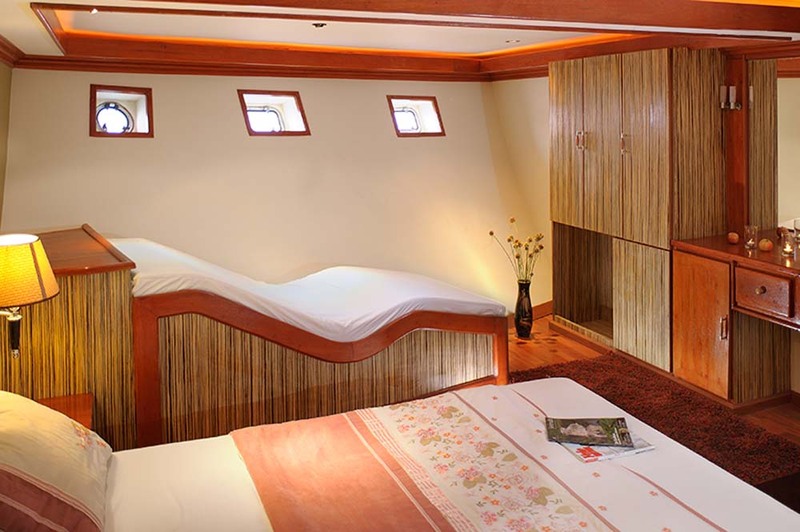 All cabins have en suite bathrooms, individually-controlled air conditioning, TV & DVD, hair dryer, safe and plenty of space to move around and store luggage. 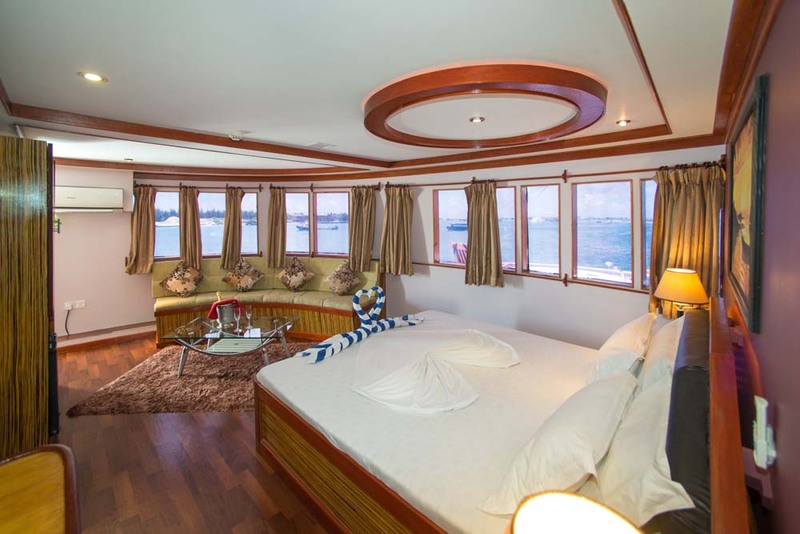 There are 10 cabins (in a combination of twins and doubles) and two luxury suites. 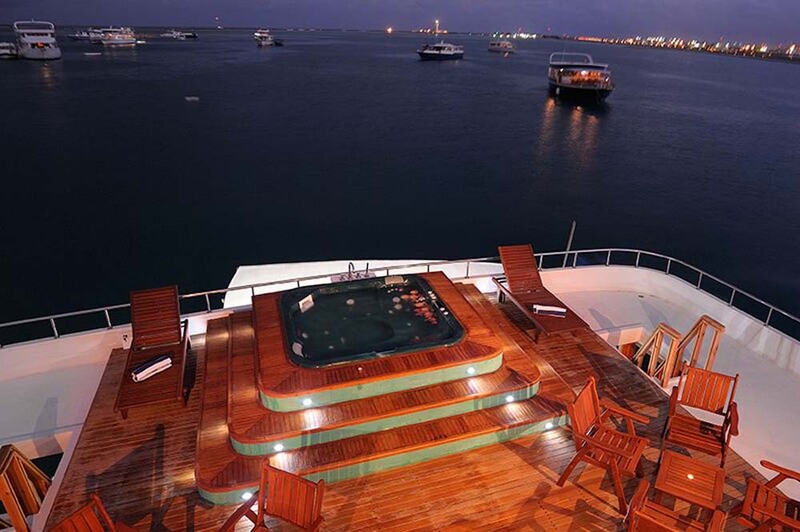 The Executive Suite even has its own private Jacuzzi and outdoor deck area. 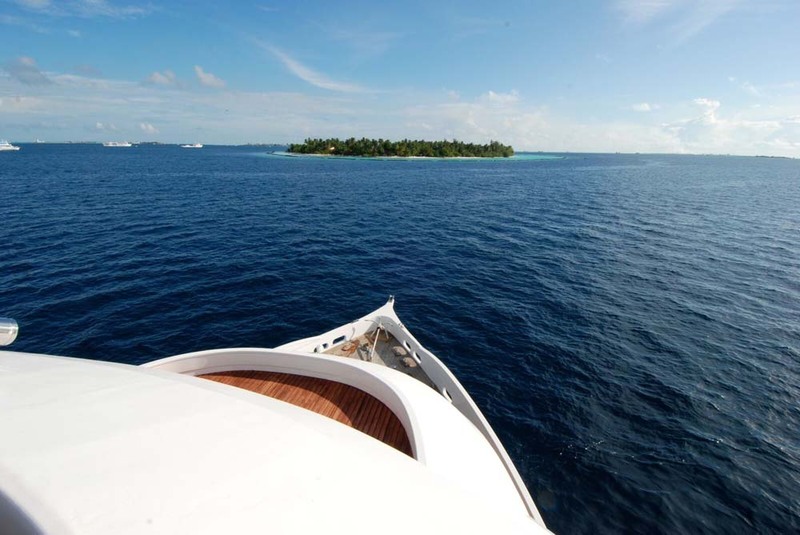 Although most Emperor Orion guests join the week-long cruises to enjoy some of the best scuba diving in the world, on-board luxury and use of space is not compromised by the activities or a dive deck. 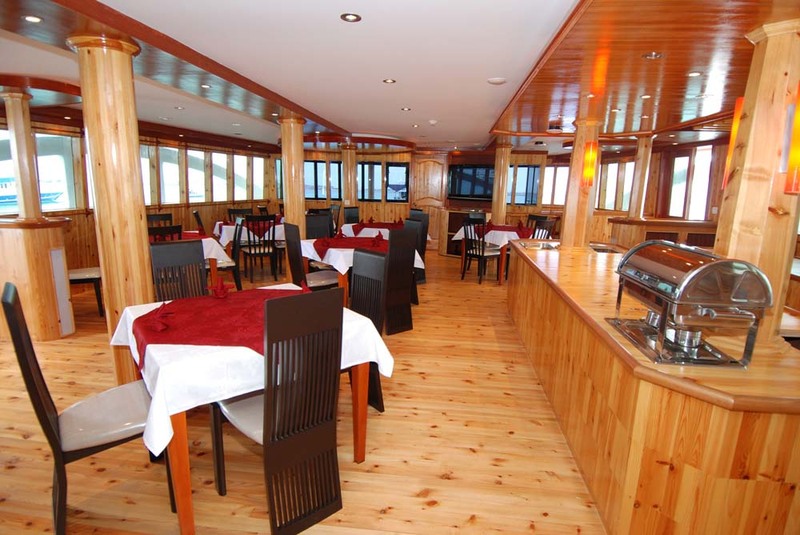 Instead, diving guests are taken to the entry point of each dive site by the 20m.-long tender boat (dhoni). The Emperor Divers crew and dive staff all speak English and are trained to high levels of customer service, diving safety and ensuring that every guest enjoys a Maldives diving cruise to remember for a lifetime. Water Makers: 2000 L / Per Day. Compressors: 2 X Bauer Compressors And Nitrox. Instrumentation: VHF Radio, GPS Chart Plotter, Telephone, Mobile. Camera Facilities: Charging Stations, Air Gun, Rinse Tanks & Camera Table. 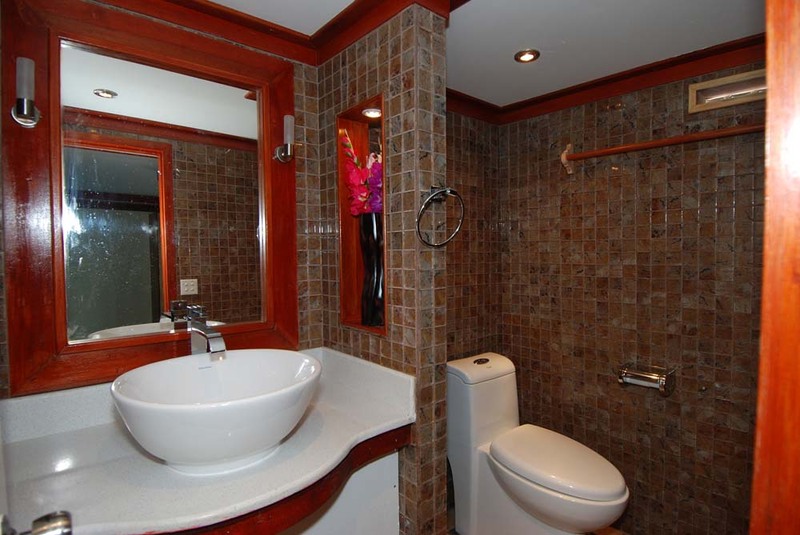 Cabins: Ensuite, DVD, Hair Dryer And Air Con. PADI & SSI diving courses are available upon request, but need to be pre-booked so that the staff can prepare. Rates are also cheaper for pre-booked courses than taking a chance by deciding after boarding the boat. 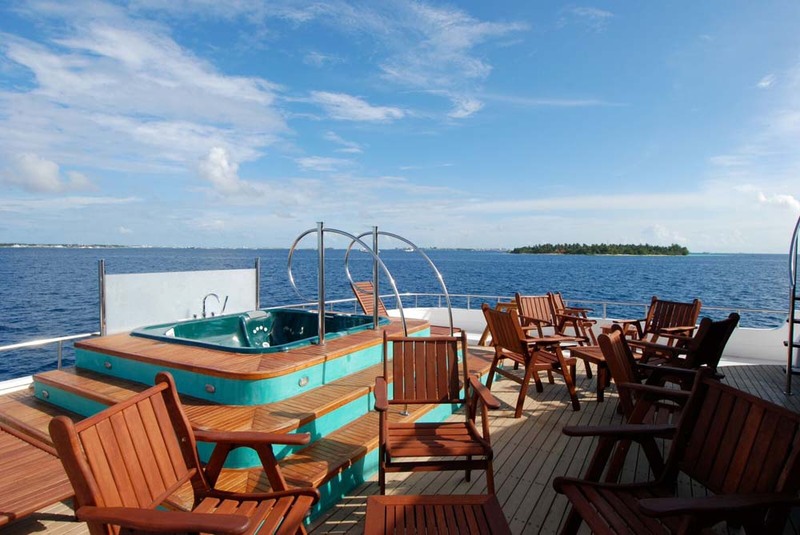 Liveaboard Maldives dive courses are excellent value, too. Dive computer rental, camera rental and torch rental not included. Courses do not include materials, certification fees or equipment. Transfers: There are free transfers from and back to Male International Airport at the beginning and end of each cruise. These are scheduled transfers, at set times. However, there are three pick up times (11.00am, 4.00pm and 10.30pm) and two check out times (7.00am & 9.00am). The boat is moored very near to the airport and the drive is usually no more than 10-15 minutes. Guests staying at a local hotel before or after their Emperor cruise need to visit the airport to join the transfers. Those who need to be collected at a time outside the schedule can contact us or the team to arrange inexpensive private transfers. 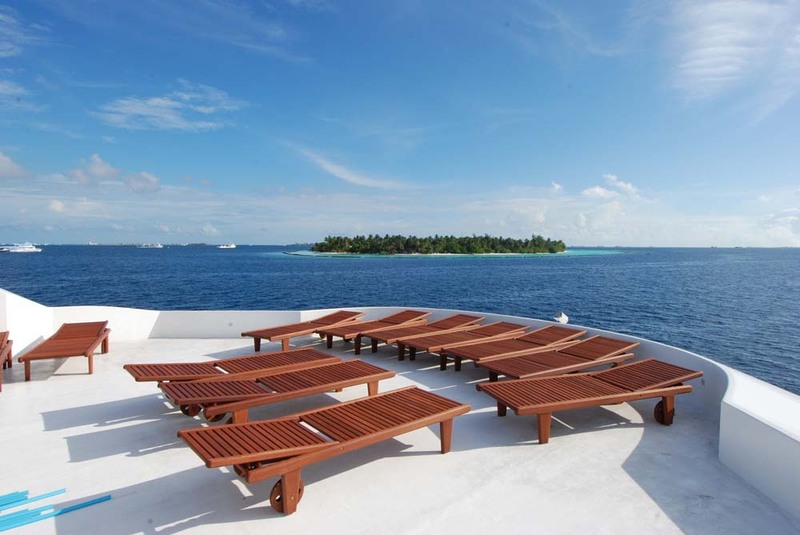 Efficient transfers at each end of a diving Maldives cruise are important to maximise convenience & enjoyment. It is important to pre-book equipment, to enable the team to prepare the items in the correct sizes. Pre-booked equipment is priced and charged in Euros € but items chosen after boarding are charged in USD $. 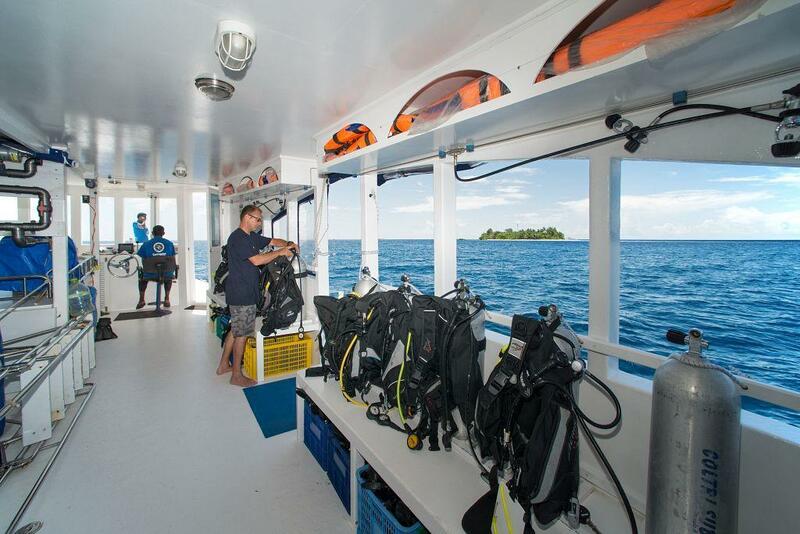 Please note that the use of SMBs and dive computers is compulsory on all of the Emperor Maldives' fleet. This ensures that safety is paramount at all times. Certified divers of all levels are welcome. Those with less experience can enjoy the special care of the experienced dive guides. Nitrox fills are free for certified divers, and the boat is set up to serve divers with rebreather equipment from certain brands. Please contact us well in advance, though.